The Best Moment of Season 17 So Far: Bill Engvall being told he was safe right after his dance. Heidi: I found this to be cringe worthy for a whole variety of reasons. First, it was stupid having CAI and Bruno up there faux dancing, followed by Julianne who, while doing reasonably well in movies ain’t the huge movie star that they pimped her to be. And I actually think she would agree with that. It was a stupid ending to a not-that-great opening dance. I get that LOTS of fans were happy to have her back on the show, but a MUCH better (and selfish on my part) way to introduce her would be to have her ACTUALLY dance with her brother. You know, the EMMY WINNER. Secondly, it was cringeworthy that they made such a big deal over Julianne, who left the show after only five seasons, after they failed to make a big deal over Derek winning them a first ever Choreography Emmy – the dude who has stuck with them and sung the party line for 12 seasons now. Perhaps I’m jealous on his behalf and perhaps he didn’t want a big deal made – but I gotta be honest and say that this pissed me off. And can understand why some pros were less than thrilled – although it’s best not to act like brats in public, Tony. Finally, as I’ve already mentioned, it just felt like a waste. Julianne comes back on the show and have the girl dance for real. I’m sure she’s not above it. Heidi: Oh, She was definitely rusty. I daresay her rustiness was part of the reason Derek dislocated his shoulder doing that dance. But damn, ANYTHING, would have been better than that opening dance with that ending. Ick. 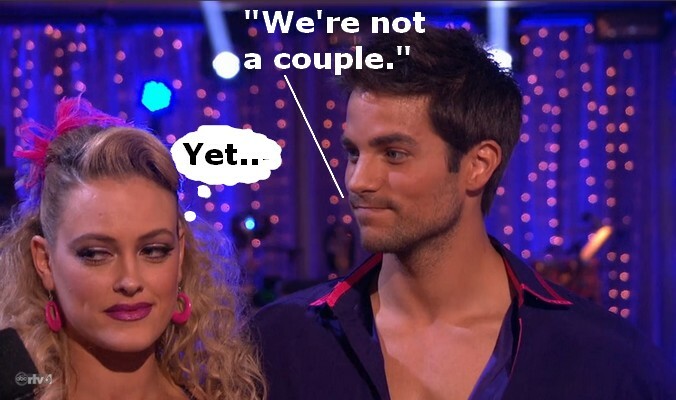 23 responses to "DWTS Season 17, Week 4 – Cheesecake Bytes"
“We’re not a couple.” “Yet.” The most accurate thing about the Brant & Peta pairing that I’ve ever seen. I just love “cheesecake”. You all have such great way about it. It always brings me a smile. LMAO at the pic of Brant & Peta! Well done ladies. 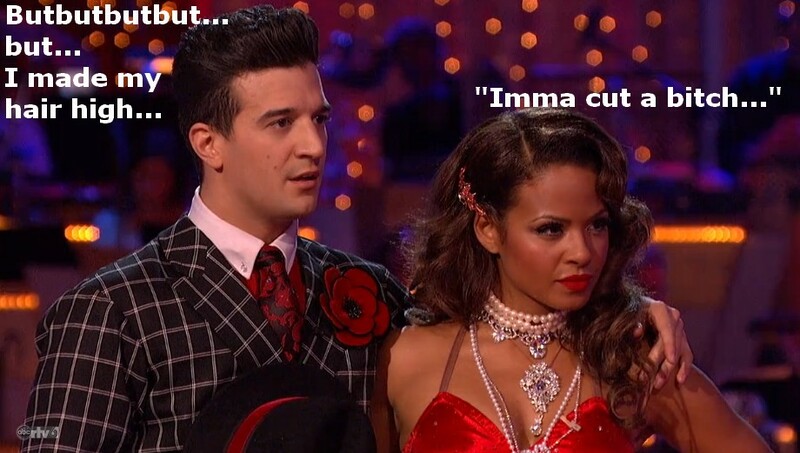 I also didn’t like the choreographed opening nor the judges entrance. Count me in on the “pissed” part of not acknowledging Derek. I’m looking forward to this week’s opening-choreographed by our EMMY WINNER!! Thanks again ladies – love the cheesecake. Loved it! Thanks for the laughs! Just love this cheesecake serving! The pics and their captions are gems! LOL! Thanks for a good laugh to start my week, mods! Looking forward to more cheese! To be fair, the show didn’t make a big deal of Tom winning the Emmy last year either. It was mentioned by Brooke at the beginning of the show and by a few of the pros/celebrities during the night. With Derek this year I remember both Tom and Brooke talking to Derek about it during the show. Thank you ladies for taking the time to comb through the show and find those fabulous screen shots! The one of Mark and Christina was perfect. He really does look like a disappointed toddler and she looks like a tough biker chick in it. Bill and Emma getting called safe and his subsequent happy and relieved emotional response has been my favorite moment on the show so far. I think of him as DWTS alchemy. The rare turning lead into gold contestant with his heart, sweetness, fun and earnestness. I think they spent enough time mentioning Derek’s Emmy. Obviously it’s a great achievement but if they mention it too many times, it’ll look like he’s overshadowing the show as ‘Emmy-winning Derek Hough’ and I think he wouldn’t want that. Also, I think that’s just Christina’s way of taking the comments on board. Very funny, ladies. Agree Val got his comeuppance after the cringe inducing slobberfest with Kelly M. Christina’s face was exactly like my dog when the cat gets too near his food dish. Eyes narrowed, lip curling. Scary. Agree about Bill. He is just so likeable. OMG you two are so funny and once again the pics just crack me up! Thanks for making my Monday! It’s not just about getting mentioned…it’s the juxtaposition of Julianne’s rock star entrance with the very low key in which Derek’s win was mentioned. Really, if you’re going to do that for Julianne, you should do more for both Tom and Derek. THAT is the point. The pics are perfect! Christina does look like she’d like to hurt someone (though I have to say, I like her better (looks-wise) without that awful red hair). And Mark looks like he can’t believe he’s getting a less than stellar review. The Brant and Peta pic is hilarious – and I don’t really want to be reminded of how awkward Elizabeth’s stare-down was. And how strange is the video (posted on Who’s Dancing What) with them skipping around? Kind of bizarre. Priceless, as always. That second picture of Elizabeth says it all. I’m sure she’s a very nice person, but she’s weird! And I can’t feel sorry for Val. After dealing with the showmance nonsense with Kelly, all I can say is, what goes around comes around. Maybe now he realizes, just a tiny bit, how uncomfortable we all were watching them. Christina appears like a know it all to me. She puts on an act when the camera is on her, but when the camera isn’t, I’m betting she’s a totally different person, and not in a good way. I think of Leah the same way too. When she’s in the bus stop, some of those facial expressions are not, shall we say, pleasant. I’m looking forward to Bill’s waltz. With him, what you see is truly who he is and that is a person having a lot of fun. The reaction he had to being called safe was so genuine, it made me tear up. That’s what this show is about. Not, like Courtney said above, the attitudes from some that they deserve votes and whatever else just for showing up each week. Don’t do the viewers any favors. I, for one, would love to see more like Bill, than those like Christina and Leah. Yeah, Julianne’s entrance was weird – but I think the only reason they treated her like that was Because she left the show and became successful outside it (combined with the fact she was popular while on it). Tom and Derek are still part of the family so unfortunately they don’t make as huge a deal about them. They figure that people get to see them every week so no need to make a big fuss. Bad priorities, not surprising to me. Ah! I’ve missed the cheesecake bytes!! I do agree the Julianne opening was a little over the top (and sort of cringe worthy) but in all honestly, I wasn’t too fond over that opening number either, in comparison to the opening numbers in the past few weeks, it was mediocre. I’m sure it was all just for jokes on Julianne’s part but it still made me laugh a little bit. OMG, hilarious cheesecake, thank you!!! I especially loved the one with Peta and Brant! ROTFL!!. I agree last week’s opening number was cringe-worthy, but I was especially annoyed about Julianne’s over-pimpage. I’ve always thought her best talent was in dance, and her acting has done nothing to change my mind. She probably should’ve played to her strengths and done a dance movie where she could really show off: she did a little bit in “Burlesque” but “Footloose” was no dance challenge for her. And, I agree with Heidi’s comments. It was a shame the show made less of a big deal about Derek’s amazing Emmy win than Julianne’s so-so movie career. Sad. The show should be on their knees thanking Derek for his many artistic gifts and for Tom being such a great emcee. Anyway, thank you mods for another fun, creative and clever cheesecake!! The opening number had the men sliding across the floor many times. It was a waste of all of their talents I thought. MORE CHEESE!!!!! I miss so many things about this one-night season, so extra thanks for this… I miss Dance Center and I miss the after dance segments on night two and I miss the tapped microphone’s and the partner talk… and I miss the all ballroom dancing – get rid of the freestyle and the contemporary… Sorry to gripe about all I miss… please, don’t take this away!! !